Today's selection -- from Origin Story by David Christian. "Primates are exceptionally brainy. Their brains are unusu­ally large relative to their bodies, and the top front layer of the brain, the neocortex, is gigantic. In most mammal species, the cortex accounts for between 10 percent and 40 percent of brain size. In primates, it accounts for more than 50 percent, and in humans for as much as 80 percent. Humans are exceptional for the sheer number of their cortical neurons. They have about fifteen billion, or more than twice as many as chimpanzees (with about six billion). Whales and elephants, the next in line after humans on the most-cortical-neurons list, have about ten billion cortical neurons, but they have smaller brains than chimps relative to body size. Large brains mean that primates are wizards at acquiring, storing, and using information about their surroundings. "Why are primate brains so big? This may seem (pardon the pun) a no-brainer. Aren't brains obviously a good thing? Not necessarily, because they guzzle energy. They need up to twenty times as much energy as the equivalent amount of muscle tissue. In human bodies, the brain uses 16 percent of available energy, though it accounts for just 2 percent of the body's mass. That's why, given the choice between brawn and brain, evolution has generally gone for more brawn and less brain. And that's why there are so few very brainy species. Some species are so disdain­ful of brains that they treat them as an expendable luxury. There are species of sea slugs that have mini-brains when they are young. They use them as they voyage through the seas look­ing for a perch from which they can sieve food. But once they've found their perch, they no longer need such an expensive piece of equipment so ... they eat their brains. (Some have joked, cru­elly, that this is a bit like tenured academics. "However, primate brains do seem to pay their way. They are needed to manage those dexterous hands and feet. And in a very visual species, they are needed to process images (is that a ripe plum three trees away? ), because images gobble up process­ing power in brains just as they do in computers. Even more important, primates are sociable, because living in groups pro­vides protection and support. The pressure to live in large groups increased in open and exposed terrain such as the spreading grasslands and woodlands of a cooling, post-PETM world. To live successfully with other members of your species, you have to keep track of the constantly changing relationships among family, friends, and enemies. Who's up and who's down? Who's friendly and who's not? Who owes me favors, and who am I in debt to? These are computational tasks whose complexity increases exponentially as groups get larger. If there are just three others, you can probably cope. If there are fifty or a hun­dred, the calculations are a lot trickier. "To live in groups, you also need some insight into the brains of others. Intuiting the thoughts and feelings of others may have been an important step toward consciousness, the enhanced awareness of what is happening in our own minds. Close obser­vation of primate societies shows that if you get these social cal­culations wrong, you'll probably eat less well, be less well protected, get beaten up more often, and lower your chances of being healthy and having healthy children. So sociability, coopera­tion, and brainpower seem to have evolved together in the his­tory of primates. 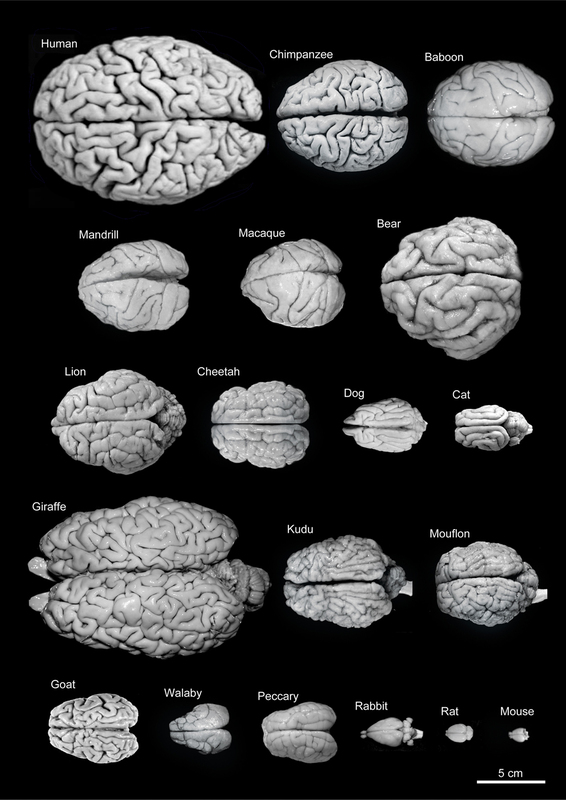 Indeed, there seems to be a rough correlation between the size of primate groups and the size of their brains. Apparently, many primate lineages were willing to pay one more entropy tax, the brain tax, if it allowed them to live in larger groups."